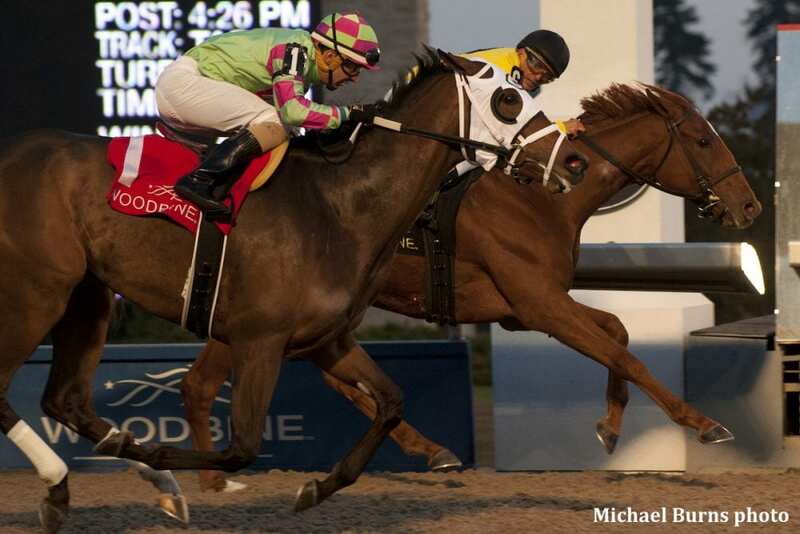 Sean and Dorothy Fitzhenry's highly-regarded filly Dixie Moon headlines Saturday afternoon's featured $125,000 Selene Stakes (Grade 3) for three-year-old fillies at Woodbine Racetrack. The 65th running of the Selene will be contested over 1 1/16 miles on the Tapeta track. The homebred Curlin–Dixie Chicken filly, who is trained by Catherine Day Phillips, received Sovereign Award consideration for her multiple-stakes winning juvenile campaign. While the chestnut filly has an affinity for the turf, she has also run well on the synthetic, breaking her maiden and later going 1 1/16 miles on Woodbine's Tapeta track to claim last year's Ontario Lassie Stakes title. She also defeated males in the Cup and Saucer turf stakes last year at Woodbine and placed in the Grade 1 Natalma Stakes. Dixie Moon wintered at Palm Meadows Training Center in Boynton Beach, Fla., and started her sophomore season in the one-mile Grade 2 Appalachian Stakes over the Keeneland turf finishing ninth. Back at Woodbine, her regular jockey Eurico Rosa Da Silva is listed to ride and the reinsman will be looking to keep his stakes streak rolling having won the last three in a row at the Toronto area racetrack. Dixie Moon will leave from post two, surrounded by last month's Fury Stakes-placed fillies Avie's Mineshaft (PP1) and Glamanation (PP3). Trained by Josie Carroll for owner Ivan Dalos, Avie's Mineshaft missed by just a nose in last year's Princess Elizabeth Stakes over the same course and distance. Last year's Shady Well Stakes champion Glamanation will try two turns for trainer Michael Doyle, who could repeat in the Selene after taking the 2017 edition with Grizzel. The field also includes newcomers Go Noni Go, who enters the Selene off a graded stakes victory in the Bourbonette Oaks at Turfway Park, Louisiana-bred stakes winner Remember Daisy, and Miss Mo Mentum, one of two Mark Casse trainees. Safe to Say is the other filly hailing from the Casse stable, supplemented off a winning season's debut on May 4 at Woodbine. Get Explicit, who finished third facing Dixie Moon and Avie's Mineshaft in a maiden race last year, completes the field. Dixie Moon, Avie's Mineshaft, Glamanation and Safe to Say are all eligible to the $500,000 Woodbine Oaks Presented by Budweiser, scheduled for next month on June 9. This entry was posted in Racing and tagged catherine day phillips, dixie moon, eurico rosa da silva, go noni go, Selene Stakes, woodbine by Press Release. Bookmark the permalink.